Looking for a Mother’s Day or Father’s Day promotion idea? Turn your Mother’s Day or Father’s Day sales event into a prize-awarding party with a “Diamonds & Dollars” or “Stache of Cash” scratch card promotion. Advertise the chance to win big for stopping by your location. With every visit to your location and/or purchase made, give your customers a Scratch & Win Card. When one of your customers unveils a grand-prize winning combination of symbols, Odds On will be there to write the check. Cards can be customized with your logos and each card features a registration section to help you build a marketing database. Award bounceback coupons and other prizes for unveiling fewer matching symbols. Need more Mother’s Day promotion ideas or a hit idea for Father’s Day? We’ve got you covered. Email us today, or give us a call at 888-827-2249 for a free, no-obligation quote! Buies Creek, N.C. – Who says a golf course can only hold a putting contest on a putting green? Well certainly not the folks at Keith Hills Golf Club who recently gave away $10,000, paid for by Odds On Promotions in a giant-prize on-court putting contest at Campbell University. Check out Larson’s amazing putt right here and find out how putting contest insurance can possibly benefit you. Learn more about how easy it is to add a putting contest to your tournament or sponsor a putting contest in any venue, email or give Odds On Promotions a call today at 888-827-2249. Add putting contest insurance to your next event and who knows… maybe you’ll have a winner of your own! Need a last-minute basketball contest idea for March? Hoop it up during the NCAA Basketball Championship by giving your customers the chance to win $25,000 during every game with Odds On’s Scoreboard Payoff Pull-Tab cards. You choose two games and if the last digit of each teams’ halftime and final scores match those on the card, your lucky fan will win $25,000, and Odds On will pick up the tab. Order today and you can distribute cards on opening Thursday & Friday, during the Sweet 16, and of course during those LAST FOUR championship games, all for just $275. Give Odds On a call at 888-827-2249 for more pricing and info on this basketball contest idea, or visit our website for more basketball promotions! 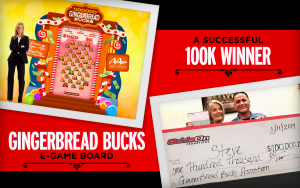 Porterville, Calif. – Congratulations to prize indemnity insurance winner Steve B. who recently won $100,000, paid for by Odds On Promotions, at Eagle Mountain Casino playing the e-Game Board game, Gingerbread Bucks – the Pick ‘Til You Win edition. Every Sunday at 5pm, from October 29 through December 30, the casino selected five qualifying players who got the chance to play the interactive e-Game Board promotion, Gingerbread Bucks, to win up to $100,000 in cash. Contestants approached the 50″ touchscreen selecting different gingerbread figures to reveal one of four cash prizes – three smaller self-insured cash prizes ranging from $1000 to $2500, and the $100K insured prize. Players picked until they collected three of the same prize, winning the indicated amount. On Sunday, December 30, the casino upped the ante, doubling all the smaller guaranteed cash prizes, giving players the chance to win between $2000 and $5000. Steve B. had the winning touch, picking a prize-winning combination of grand prize symbols, scoring $100K, paid for by Odds On. Want to learn more about using Odds On’s crowd-pleasing interactive 50″ and 80″ electronic-Game Boards to drive traffic during your next sales event, tradeshow, casino membership drive or fundraising special event? Visit our website today to learn more about Odds On’s traditional or electronic-Game Board Games or give us a call at 888-827-2249. Prize indemnity insurance could pay off for your company too! Looking for the perfect March basketball contest? Give your players the chance to win up to $1,000,000, paid for by Odds On Promotions, in a fully-automated, online bracket prediction promotion. • Contestants are provided with an exclusive access code. • Players visit your website to access the customizable game portal, enter their code and fill out their bracket. 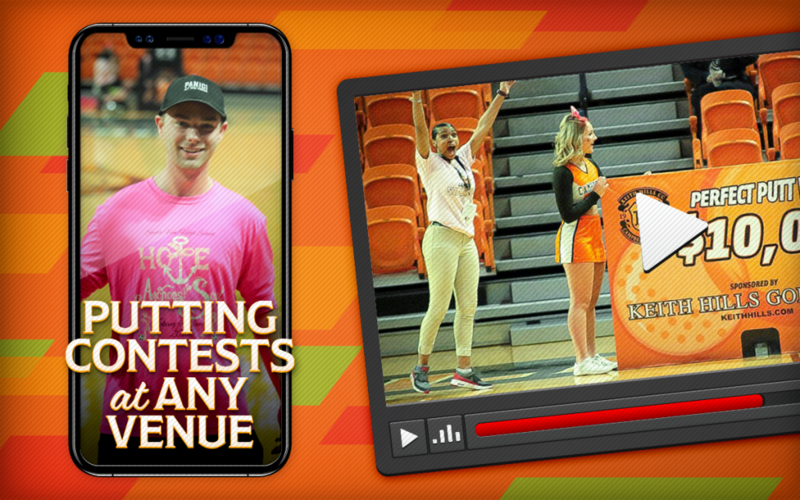 • If one of your patrons correctly predicts 63+ games at the end of the tournament, they’ll win your insured grand prize and Odds On will pick up the tab. This web-based promotion ensures maximum fun for your customers with limited staff involvement. Looking for more March basketball contest ideas? We have plenty of those too! Give us a call at 888-827-2249 today with any other ideas you might have.